For Earth Day 2016 the Sapp Design Team celebrated in two ways to promote and raise awareness to environmental issues. To start off the the day we opened Springfield’s new Clean Water Operations Center! This new 12,000 sf center promotes environmentally friendly building practices with a Leadership in Energy and Environmental Design Level of LEED Silver. The the highlights of this facility are its 2,900 gallon cistern, rain gardens and lot of natural light on the buildings interior. Later in the day, we were off to do some trash clean up around Springfield Lake and below the dam along the river. 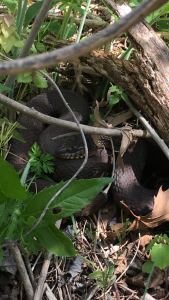 Our team had a great time and even got to see some of our local wildlife…..Snakes!